JetBlue Airways on December 13 announced the start of new service in Bozeman, Montana, with the arrival of the airline’s inaugural flight landing on schedule just before 2:30 p.m. local time (below). Above Photo:. Bozeman Yellowstone International Airport. Roundtrip flights between Bozeman Yellowstone International Airport (BZN) and Long Beach Airport (LGB) will operate twice weekly on Thursdays and Sundays on a summer and winter seasonal schedule. Bozeman is JetBlue’s first destination in Montana. 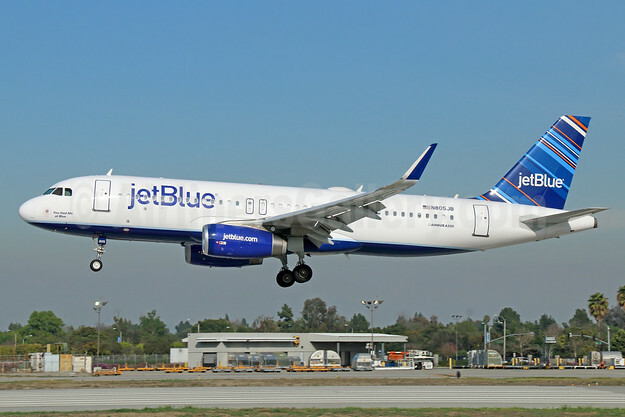 JetBlue will operate new Bozeman flights using its Airbus A320 aircraft. The first flight was operated with the pictured N805JB. Top Copyright Photo: JetBlue Airways Airbus A320-232 WL N805JB (msn 5148) (Barcode) LGB (Michael B. Ing). Image: 931273. This entry was posted in JetBlue Airways and tagged Airbus A320-232 WL, Barcode, Bozeman, JetBlue Airways, LGB, msn 5148, N805JB on December 14, 2018 by Bruce Drum.